Magnets have both a north pole and a south pole. 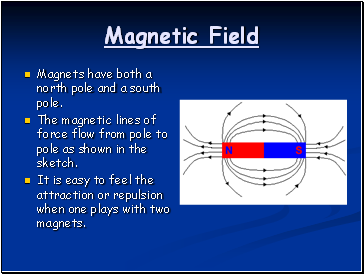 The magnetic lines of force flow from pole to pole as shown in the sketch. It is easy to feel the attraction or repulsion when one plays with two magnets. 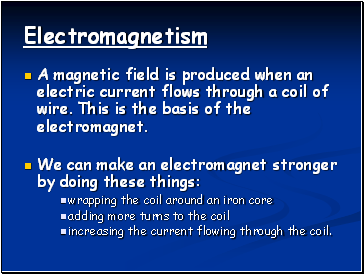 A magnetic field is produced when an electric current flows through a coil of wire. 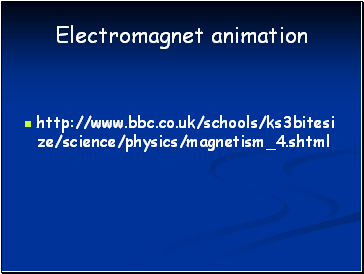 This is the basis of the electromagnet. increasing the current flowing through the coil. Many objects around you contain electromagnets. 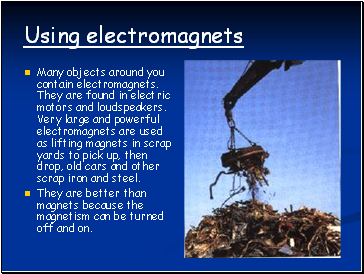 They are found in electric motors and loudspeakers. Very large and powerful electromagnets are used as lifting magnets in scrap yards to pick up, then drop, old cars and other scrap iron and steel. They are better than magnets because the magnetism can be turned off and on. 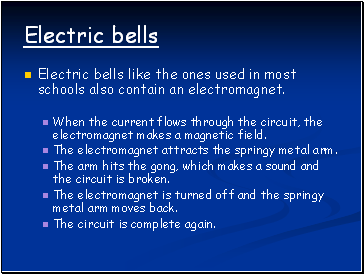 Electric bells like the ones used in most schools also contain an electromagnet. 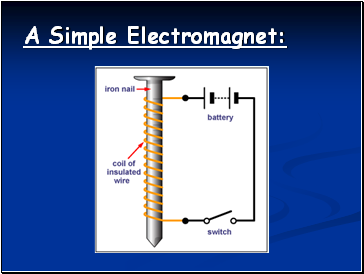 When the current flows through the circuit, the electromagnet makes a magnetic field. 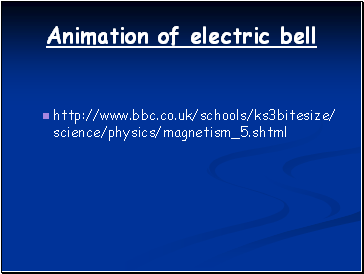 The electromagnet attracts the springy metal arm. The arm hits the gong, which makes a sound and the circuit is broken. The electromagnet is turned off and the springy metal arm moves back. The circuit is complete again. All objects have a force that attracts them towards each other. This is called gravity. 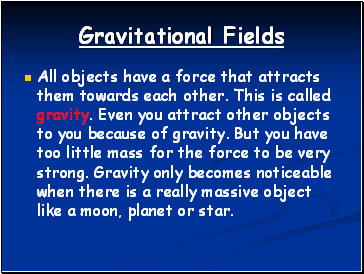 Even you attract other objects to you because of gravity. But you have too little mass for the force to be very strong. Gravity only becomes noticeable when there is a really massive object like a moon, planet or star. 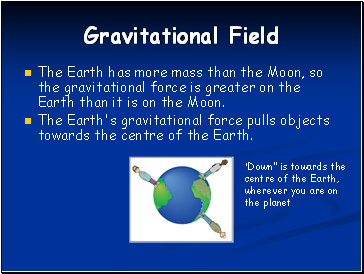 The Earth has more mass than the Moon, so the gravitational force is greater on the Earth than it is on the Moon.